timebymail ... watch and jewelry accessories Shop about us feedback People are saying that watch repairing is a dying trade, well let us help you find top quality horologist tools and accessories at trade prices. We specialize in supplying watch repair kits and accessories to the trade, we try our utmost to supply all the tools you'll need to repair your watch, from the budget starter packs to high quality Swiss tools. Other Products shop Leather Straps 16 to 30mm Omega Dynamic Straps Stainless Steel Straps Rubber/Silicone Straps Nylon Watch Straps Swatch Straps Other Watch Parts Wholesale Watch Straps Vintage Watches/Straps Watch Tools Watch Crystals Clock Parts and Tools Jewelry Tools and Display Genuine S. EPSON CORP. VX43 6 O'Clock Replacement Quatrz Movement Original replacement VX43 (6 O'Clock) movement and stem. Please check your movement number before ordering. 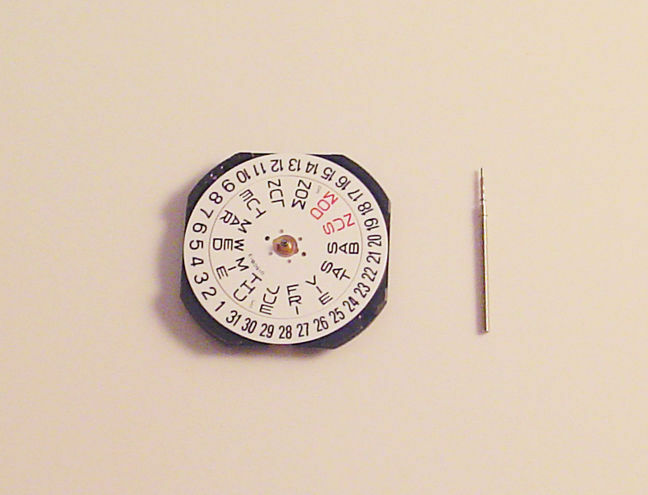 This is an original S. Epson Corp movement that will fit Seiko watches. All item specifications are listed below, along with 2 photographs and a diagram of watch dial type. Due to the nature of this product we do not accept returns because you have ordered the wrong movement. Please check item spec below We have a large range of Seiko / Miyota / Ronda / ETA movements in our shop. Condition - NEW Brand / Model - Epson (Seiko) / VX43 (Date 6 O'Clock) Function - 3 Hands Day Date Hands - 65/110/20 Wording on Movement - No Jewels S.Epson.Corp. VX43E JAPAN Battery Type - 371 Included in sale - 1X Movement / 1X Stem / 1X Battery (for bench testing only) We would be grateful if you could confirm your address as soon as possible after payment is made. We are truly sorry for any inconvenience this may cause but unfortunately Paypal are giving some addresses as "Not Verified".